If you’re serious about gardening then you need a high quality shed, but that doesn’t necessarily involve a big investment. 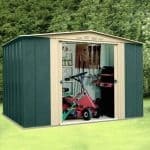 Shed Baron are famous for producing high quality metal sheds that are very affordable, and we found that this pent shed lives up to their reputation. It features a compact design which makes it perfect for use on smaller gardens, or where a person only has a patio area on which a shed could be erected. Despite its relatively modest dimensions it manages to create a versatile storage space, thanks to the wide sliding doors and the high eaves below the pent roof. We were surprised at the headroom this shed afforded us once inside, and it means that you’ll be able to fit taller tools and shelving units inside. Weather resistance is a key consideration when choosing a shed. Metal sheds already have an advantage in this area, as they don’t suffer from rot or splits as timber sheds can. This shed in particular has very good waterproofing qualities, thanks to the high quality galvanised steel used. It’s one of the factors behind the no rust guarantee provided, which makes it even better value as well as giving added peace of mind. When we review metal sheds we like to look for features that elevate them above the ordinary, and add extra value to the customer. One factor that does that for this shed is its appearance. 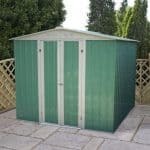 Painted dark green, it has a much more interesting and traditional appearance than most metal sheds, and so wouldn’t look out of place in any garden. The paint, which we found to be tough and well applied, also adds an extra protective layer against rain and the sun. The pent roof on top of the shed is in a contrasting white, an effect we found pleasing and again a feature that people will comment on positively. The roof gives a ridge height of 1.98, backed up by an eaves height of 1.78m. 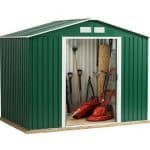 This made it easy to stand up straight when inside the door, in contrast to some other lightweight metal sheds. The overall width of the shed is 1.71m and the overall depth is 1.13m. We were impressed with the extra attention that had been paid to the cladding on this shed, which is all important on metal garden buildings. It is made of steel to a thickness of 0.35mm, which is quite light, but this is then treated by a hot dip galvanisation process that makes it both rain resistant and extra tough. As a consequence of this, it felt strong and ready for any weather once we had assembled it. No flooring is included, which is normal for metal sheds as they’re designed to be installed upon a concrete base. This base must, of course, be level and must match or exceed the outer dimensions given above. 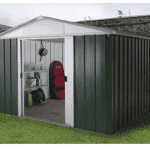 Steel and timber flooring kits are available as optional extras when you purchase the shed. Being metal, there is no need for annual treatments, saving considerable time and money over the shed’s lifespan when compared to a timber shed. A warranty is provided by the manufacturer against perforations resulting from rust, but at the time of writing this review we were unable to get clarification from the retailer or manufacturer as to how long this warranty period lasts. Therefore, if the length of warranty is particularly important to you, we would advise you to contact the manufacturer directly to seek further clarification. We like to see double doors on smaller sheds such as this, as it allows the owner to make the most of the storage space. This shed features double doors that slide effortlessly apart. Their width of 0.69m is not the widest we’ve seen, but is still a step up from single doors. 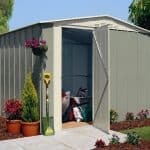 The height of 1.70m is around the average for a metal shed of these dimensions, and means that entering and exiting the shed isn’t too much of a struggle for all but the tallest owners. There are no windows in this shed, and we find that this can sometimes create a stifling almost airless atmosphere inside a shed. That’s why we were pleased that ventilation is included in the gable ends, making the interior a much more comfortable environment. Whilst the double doors are fitted with a pad bolt which can be used to keep the doors securely fixed, a padlock is a must have accessory if you plan to store anything valuable inside. We were disappointed that a padlock wasn’t included as standard, but a padlock and alarm system from a leading name such as Yale is available for less than £25. The windowless design itself makes the shed more secure, by concealing whatever is kept inside. Which optional extra you select with your shed depends upon what kind of base you wish to use with it. If you already have a suitable concrete area, then all you need are the set of 16 expansion screws, priced at £10.50. Alternatively you can purchase a steel foundation kit which contains everything needed to create a durable base. For £60 a timber floor kit is available. We were happy to see this available as an option, as many people prefer the traditional appearance of a wooden floor, although compared to the cost of the shed as a whole it does add considerably to the cost. We would usually prefer steel cladding that was a little thicker, but the galvanisation process helps to create a structure that seemed solid when installed. The high quality of components used should ensure the long life of the shed as a whole, however exposed to the elements it is. This 6 foot by 4 foot shed would have benefitted from the extra space that a pent roof could provide, but the high eaves help to make up for this shortcoming. By following the instructions, which we found suitably easy to follow, two of us installed this shed in under four hours. 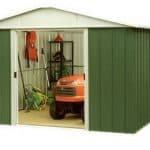 Even for its compact size, this shed represents good value for money, but this is amplified by the fact that owners can install it and then have at least twenty worry free years. 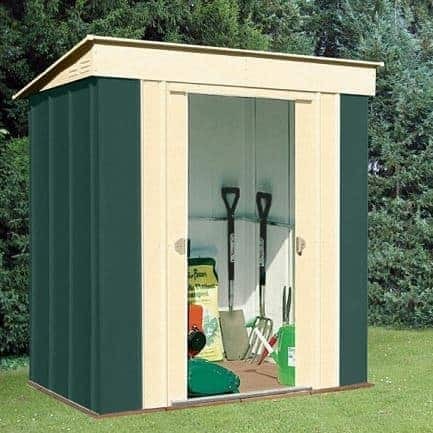 Final Thoughts: If you are after a small, good value, garden shed that will give extra storage space for your garden goods, then this is well worth considering. We were impressed by the colour scheme, and by the quality of the galvanised steel. Rust can be a major risk to metal sheds in our damp climate, but this shed has been designed to effectively combat the appearance of rust, giving a durable and good looking shed for years to come. Be sure to purchase a padlock, though, if valuable tools are to be kept inside, as this shed comes padlock ready but without the lock itself.